Amateur astronomer Andrew A. Common built the Crossley Reflector in Great Britain in 1879, around the time that the Great Lick Refractor was built. 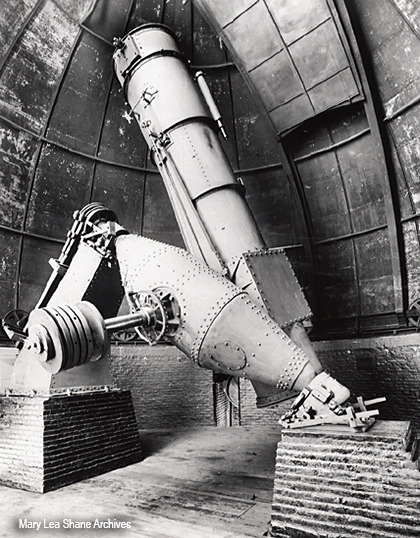 The Great Refractor was one of the last large refractors built, and the Crossley was one of the first large reflectors built. Large reflectors became practical after 1880, when a new technology for making concave, silver-coated glass mirrors was perfected. Prior to this, such mirrors required constant polishing to remain reflective. With his reflector, A.A. Common was the first to discover that stars too faint to be seen through a telescope with the eye could be imaged in photographs taken through the telescope using a long exposure time. This discovery is the basis for all modern astrophotography and spectroscopy. For these early astronomical photographs, Common was awarded the Royal Astronomical Society gold medal for Astronomy. After deciding to build a larger telescope, Common sold the 36-inch reflector to Edward Crossley in 1885. Crossley built a new dome enclosure to protect the telescope and observers from the harsh Halifax (UK) weather, but this climate was far from ideal for observation. 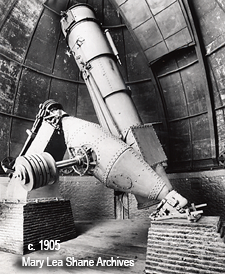 After about 10 years, Crossley donated both telescope and dome to Lick Observatory, where it was put into operation in 1896. Lick Observatory director James Keeler used the Crossley to produce early photographs of nebulae, fuzzy-looking areas in the night sky, in the hopes of better understanding their nature. To his surprise, he saw many fainter nebulae in the background of his Orion Nebula images. Previously, astronomers had thought that all nebulae were pretty much the same, and that they were rare phenomena. Keelers photos with the Crossley reflector showed that nebulae were in fact quite common. They also showed a variety of different types of "nebulae." Some of these were areas of interstellar dust that we still call nebulae today. Others were actually spiral galaxies filled with billions of stars. Such detailed photographs were possible because this reflecting telescope focused light more effectively than the 36-inch refractor. 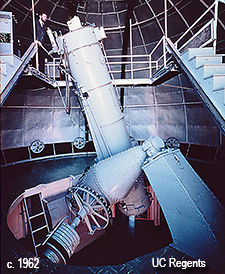 Thus Keelers photos also showed the superiority of reflectors to refractors for modern astronomical research. The 36-inch Crossley reflector was used for observation extensively before the 120-inch Shane reflector was built on Mt. Hamilton in 1959. After this, the Crossley reflector was used occasionally for research until 2009, although it has limited light-gathering ability and is not physically easy to use (see 2004 image above with scientist standing in observing position). Research in the recent past includes SETI (Search for Extraterrestrial Intelligence) projects, eclipsing binary star research, and some extrasolar planetary search observations. When the Crossley Reflector first arrived on Mt. Hamilton in 1896, William Hussey, who had been assigned the task of making the Crossley operational, called it a "pile of junk." This attitude was reflected in his work on the Crossley, and it was not until James Keeler arrived in 1898 that serious rennovation of the Crossley was begun. 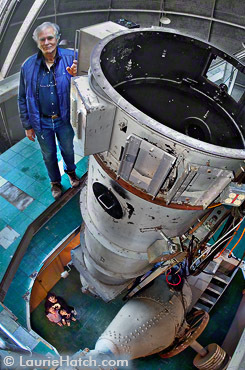 The Crossley telescope has now been upgraded to the extent that no original telescope parts remain (note photos above). 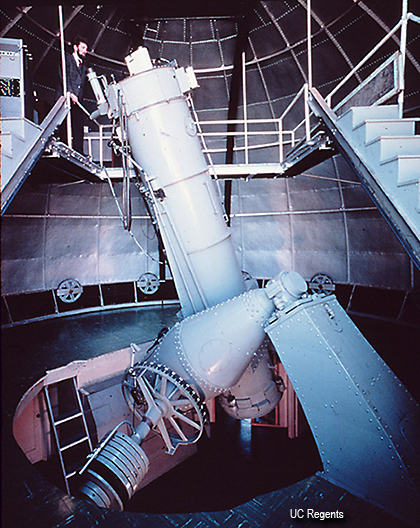 Keeler adjusted the inclination of the axis of the telescope to the correct angle for Lick Observatory's latitude, aligning the telescope with the earth's axis. 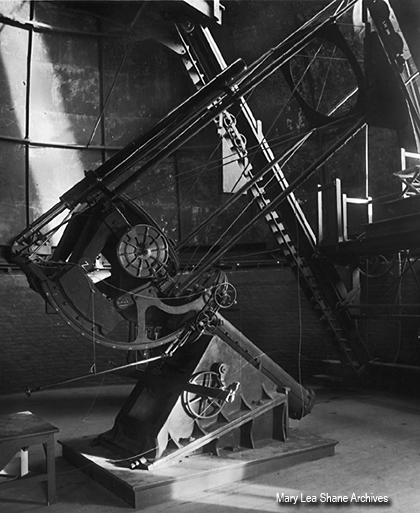 He then adjusted the drive clock, enabling the Crossley to follow star motions more accurately. He also removed the old mirror coating, applied a new reflective surface, and made other upgrades. 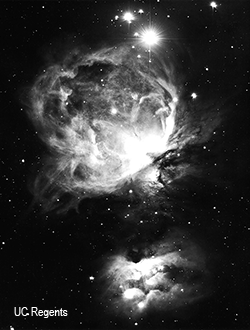 By 1899, Keeler had taken his series of nebulae images. These were impressive enough to cause a sensation at a meeting of the fledgling American Astronomical Society (AAS). After Keeler's death in 1900, Charles Perrine completed Keeler's collection of nebulae photographs as well as overseeing dramatic improvements to the Crossley. 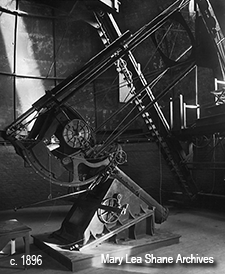 Between 1902 - 1904, Perrine improved the mechanical mounting, drive, and gears such that the telescope tracked more accurately. He redesigned the way that photos were taken by removing a secondary mirror and installing a plateholder at prime focus (top of telescope). This increased the amount of light available to expose the photographic plates, as light reflected off only one mirror instead of two. Finally, as illustrated in the 1905 photo above, he replaced the minimal lens mounting structure with a rigid tube. This solved the problems of the mirror slipping and the telescope flexing under its own weight during observation at certain angles and under windy conditions. Compare the photos above to see how the Crossley has changed. (Click on images for enlargements). The photo at the top of the page, taken in 2004, and the photo from 1965 illustrate one of the fundamental challenges of observing with the Crossley. To look through the telescope, observers must stand on a mezzanine 25 feet above the dome floor. Observers must take extreme care not to step too close to the edge, to avoid falling, regardless of how sleepy they might be during long observing nights. Remarkably, considering the physical challenge of using this telescope, its age, and its limited light-gathering capacity, this telescope was still used until recently for research. The photograph of the Orion Nebula above, taken with the Crossley reflector in 1928, illustrates the fine detail that the Crossley is capable of imaging. Click on photo for enlargement. This photograph is frequently used in science educational materials and amateur astronomy publications.